Evyl Robot loads a magazine while another friend sets up his Remington 700 to spot for us. By now, if you follow this blog or my posts on Facebook you know that I acquired a .50 Caliber Barrett M82A1 semi-automatic rifle last week. This is one of those notch-in-the-belt purchases for me, a rifle that has been on my “one of these days” wishlist for quite some time. So to say that I was a little excited over the purchase is a bit of an understatement. Naturally, after acquiring my new baby I had to find a time and place to go sight it in. Not many ranges allow .50 BMG rifles, and even those that tolerate them frequently have only 100 yard distances available. We needed a bit more than that, so I gave Evyl Robot a ring and we set up a time to visit his property in Central Oklahoma (site of the COGS – Central Oklahoma Gunblogger Schutenfest). According to GPS and confirmed by Google Maps, we had a range of just under 650 yards: perfect since my new M82A1 was also zeroed at that range according to the seller. That zero gave me a maximum rise of just over 2 feet at around 350 yards and a drop of only 3 feet at 800 yards. This is a pretty decent compromise, and things get pretty silly with regards to drop past 850 yards, so I was content to leave the rifle zeroed there. We inspected the berm to make certain that we had a good backstop. The M33 rounds I had brought with me had a muzzle energy of over 13,000 ft-lbs, and even at 650 yards was still speeding along at over 2,100 FPS and carried enough energy to hit with over 6,500 ft-lbs of force. With that much energy, it’s not unheard of for .50 BMG rounds to partially penetrate and then exit a berm at high speed, possibly continuing for another few thousand yards before finally coming to rest. We definitely wanted to avoid that. After ensuring our backstop was sufficient, we assembled the rifle and I took the first few shots. They did not go well. The bolt was overriding the round in the magazine, wasn’t going into battery when a round was fed, and we had numerous issues with misfires. I fought with it for a while and then pulled the magazine and looked it over. It was not a Barrett brand magazine: no stamp in the follower, and no white serial number in the floor plate. It’s not the most stable platform, this rifle is heavy, but you can shoot the M82A1 off-hand. After replacing the magazine, we began walking the rounds in, initially holding a bit low and then coming up onto the target after confirming hit location from the spotter. It only took a couple of rounds to realize that the scope was still zeroed at the 650 yard range that the seller had mentioned. Our targets were small. We had a box and a water bottle, both about 4″x6″ – or a little less than 1 MOA at that distance. Now you have to understand a little bit about the M82A1 and the .50 BMG round at this point. Neither the rifle nor the round were designed with extreme precision in mind. On top of that we had high winds blowing about 15-20 and gusting higher. The wind direction was blowing directly head on, 345-15 degrees or so, meaning that we didn’t have too much deflection. Regardless, it did affect accuracy. Running the ballistics table we found a possible 5 MOA variation from wind gusts. The rifle was designed to take out enemy materiel on the field of battle. Hitting the engine block of an armored vehicle is not terribly difficult. Successfully hitting a target only slightly larger than a human head on the other hand is pretty hard to do, even with the right rifle and ammo. Nevertheless, we hit all over our targets, in about a 2 MOA radius: well within the acceptable levels for this rifle/ammo combination, when you consider that we’re NOT snipers, we were shooting M33 ammo, and had high winds. With the right ammo, this rifle is easily capable of sub-MOA accuracy. I’ve no doubt that if we were shooting at an engine-sized target at 1,000 yards that we’d have had no trouble hitting it. One thing people who have never fired this gun before don’t realize is just how efficient the recoil system is. 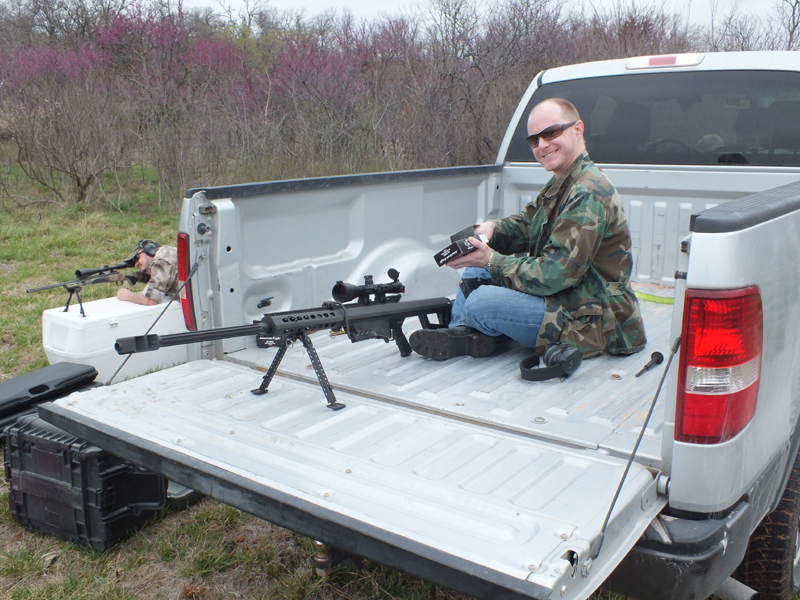 Don’t get me wrong, the .50 BMG is a huge round and the overpressure from the muzzle blast is enormous – akin to getting punched in the chest. But what is missing is the mule-kick in the shoulder from the buttstock. The rifle does recoil, but nothing more than a stout .270 Winchester in a bolt action rifle. The arrowhead muzzle brake, the recoiling barrel, the fact that it weighs over 30 pounds, and the semi-automatic configuration make the M82A1 very easy to shoot… once you get over the fact that every trigger pull is around $5 each. BAWOOM! That’s a nice lunch. BAWOOM! Pack of cigarettes. BAWOOM! Could have gone and seen a movie. BAWOOM! There goes date night. Yeah, it’s not a gun you just run rounds right through. It is on the other hand a great way to turn money into noise. Honestly, once we ditched the off-brand magazine, the gun ran flawlessly. Typical of Barrett construction, this thing is nigh indestructible, and accurate to boot. 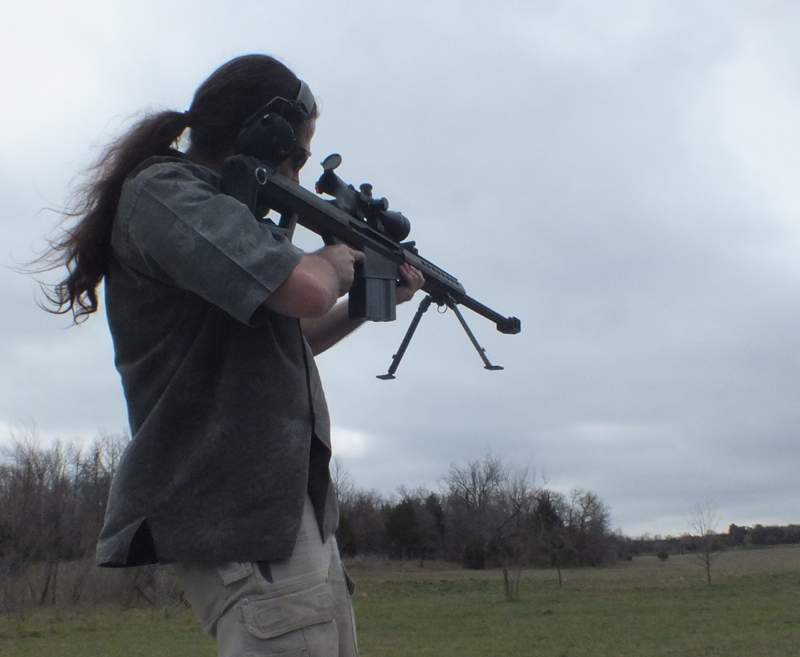 Shooting .50 BMG rounds beats the hell out of most rifles. Barrett has a design that can handle the cartridge as well as any environmental conditions. This gun is a beast, no doubt about it. It’s been on my wishlist for the better part of a decade, and it’s the Holy Grail of rifles for gun collectors of all stripes. For a reason. Barrett has designed a rifle that is capable of 1 MOA accuracy out past 1,000 yards with the right person behind the trigger. Very nice, and yes it IS a beast, but it gets the job done! Your A Lucky Guy.Would Love To Have One Of Those. Time to join the FCSA, eh?